Like I said last week, it's funny how you remember things. When I look through the stunning visuals in OG, I often find myself thinking, "That must be a dive that will never be forgotten in the mind of that diver…..what an amazing image." Of course, this thought usually happens as I am looking at breaching humpbacks, or sharks diving in and out of spiraling bait balls or some amazing mantis shrimp macro shot. I have these memories regarding many of my own dives as well. 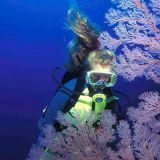 In various places around the world there have been walls covered in hanging soft corals, slopes full of barrel sponges and anemones, reefs teaming with colorful hard corals and schooling fishes, turtles, sharks….you know…the sights and sounds that keep us counting nickels and dimes and denying our kids new tennis shoes for the upcoming school year because we need……oh, wait, never mind. Got sidetracked. Anyway, for all the amazing dives I have done and all the amazing sights I have seen, it strikes me as somewhat astounding that one of my most vivid memories ever is of one of the littlest members of the ocean community……a sea urchin. 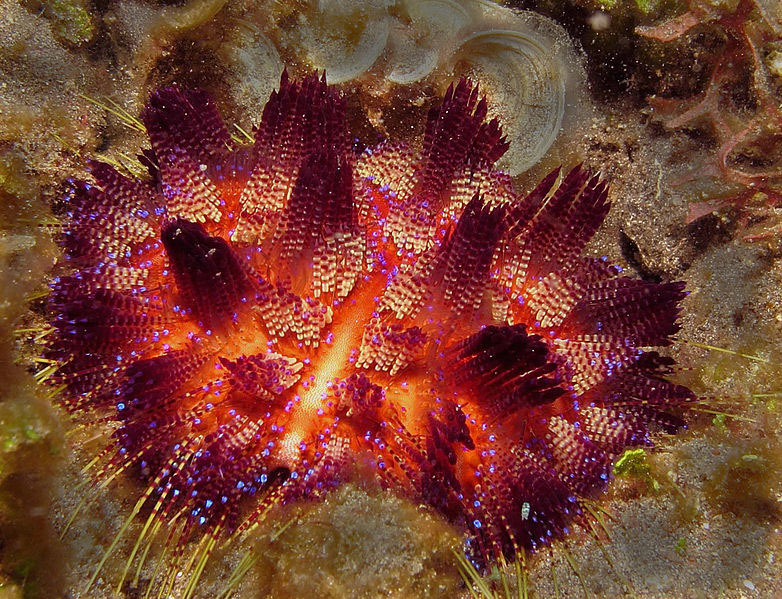 The species is Asthenosoma varium, a fire urchin. They belong to the phylum Echinodermata along with sea cucumbers, sand dollars, sea stars, brittle stars and crinoids. As a diver, I've always had a special attachment to echinoderms since,with its almost 7000 species, this is the only phylum comprised entirely of marine animals…no land-based relatives at all. Asthenosoma varium urchins are lovely with their orange bodies and short iridescent purple spines and are quite common in the Indo-Pacific region. They are also poisonous. Not fatal to humans, but fantastically painful if you should happen to impale part of yourself on their shimmering spines. They thrive in areas where algae is plentiful. Exposed rocks, for example, make great habitat for these little vegetarians. Exposed rocks with plenty of nooks and crannies for sheltering purposes are even better. Let me tell you about the very best habitat for this beautiful little urchin that I have ever seen. We were booked on the Baruna for 2 back-to-back 10 day trips. The first trip was designed to find the really great sites. Michael was expecting a rather well-known photographer on the second trip, and we wanted to have some good stuff to work with. So, only one day into our trip, it was decided that we would check out the legendary, "Kal's Dream". Let me offer you some perspective on the layout of this dive site. The island of Alor is situated directly east of a much smaller island named Pura. About ¼ mile of water separates the two islands in the form of a channel that is as deep as 600 feet. In the center of the narrow channel, three ridges reach up from the depths and come to within 15 feet of the surface. The tidal volumes of water that wash through this narrow channel are immense, and as they surge through, the ridges act like rudders. The result is amazing. To the north of Pura, the channel opens up and the waters are calmer; however, during the tidal changes the water in the center of the narrowest part of the channel resembles the stage 3 rapids on the Colorado River. The allure of this sight had to do with the man for whom it is named, anthropologist, Kal Mueller. Apparently, he witnessed enough pelagic wonders in the form of Napoleon Wrasse, sharks and barracuda that this potential site for amazing underwater images found itself at the very top of Michael's list of sites we must check-out. But the key, according to Kal, was to dive the Dream when the current was at its strongest. That, he asserted, was what drew the large animals. Having checked the tidal charts for the day, we found ourselves up on deck at 6:00am in order to assess first-hand how to best manage our entry before the main force of the tidal change arrived. Although we had been unable to spot the top of the Dream from the surface of the water, as the current picked up, we certainly could see where it ought to be. The water was boiling the entire width of the channel, but right in the center, where the Dream came to within 15 feet of the surface, it was downright frightening. The discussion centered around the best way to approach the dive site once we were underwater. The current was too strong to allow us to descend normally and have any hope of ever reaching the site before being blown off. It was decided that the Zodiacs would take us up the channel to the point at which it opened up and the current was slack. The Baruna was positioned at the opposite end of the channel with the idea being that she could collect us as we got washed off the Dream at the end of the dive. I was somewhat concerned about trying to manage the underwater camera gear in those conditions. Happily the two large housings and four strobes I was normally charged with magically turned themselves into a single, manageable Nikonos V with a couple of very modest strobes. This small set-up was conveniently located on a strap that went around my neck, leaving my hands completely free. And I was going to need both my hands. We divided ourselves up into groups of four. Our group consisted of Michael, two other divers, and myself. As the current picked up, the Zodiacs headed north directly into the current. We bounced along over the boiling water, and I began to wonder about my decision to come along. I had been offered the choice to stay onboard, but my curiosity had gotten the better of me. However, although I was an instructor with several hundred dives logged at this point, most of my dives had been inland dives with a decided lack of current. I had some fast-water river training, but the scenarios were carefully controlled and we had really hi-tech equipment specific to the situation. This looked intimidating. As we cleared the northern edge of Pura, the channel opened up and the current slacked off. We motored up a few hundred feet and got ready. The plan was simple. We peeled backwards over the side of the Zodiac, righted ourselves, and swam down to 130 feet like penguins trying to outwit a a leopard seal as the current caught us and shot us forward. I couldn't see anything much at first; it was very dark, but actually, it was pretty fun. All of a sudden, a dark ridge materialized in front of me, and I realized we had arrived at the site. We were moving incredibly fast. The current had been estimated at between 4-6 knots, but let's just say stupid fast. It became pretty important pretty quickly to decide how to exit the torrent and grab onto some solid reef. Think of that scene in "Finding Nemo" where Marlin and Dory are learning how to exit the EAC…. It seemed like most of the divers managed to grab a piece of the Dream successfully, although we lost one diver right off the bat. He turned out to be fine, he just had a really short dive. The remaining three of us were busy crawling, literally, hand over hand up the ridge trying to find a bit of shelter from the brutal current. We found some overhangs, huddled our way in, and turned around in anticipation of the amazing schooling marine life we were about to encounter.